Hello guest reader Joel. 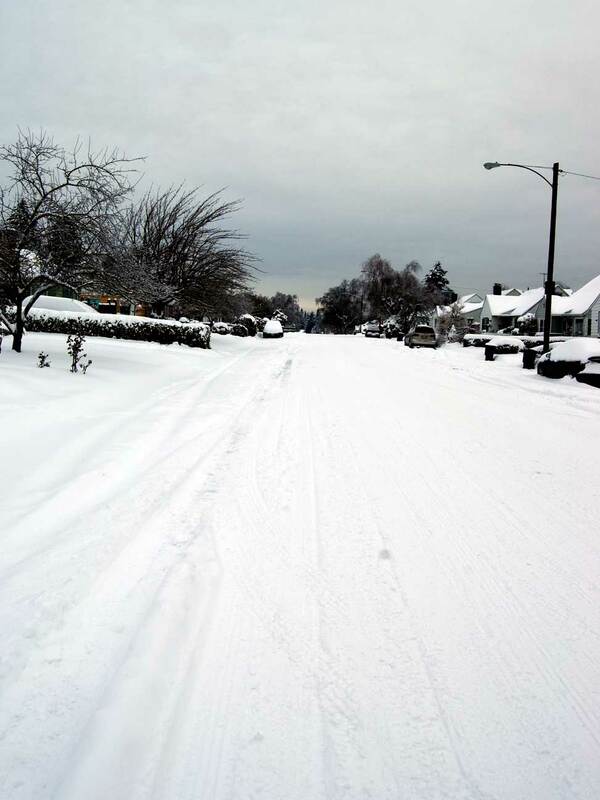 Sorry your flight got canceled and you can’t be in town to enjoy all this endless snowy mess. *Note snow on roof. Will figure in later in this post. 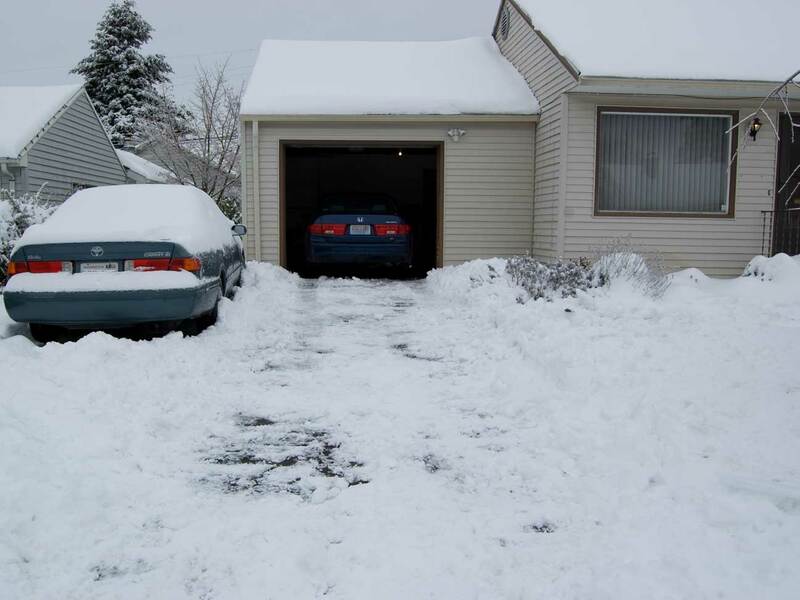 This is our “cleared” driveway from yesterday. I had the front porch and walkway all cleared off, too. It felt like we were making progress. Here’s our street. I thought I had the exact same photo from this fall but I can’t find it right now because I’m lame at organizing my photos and searching through a couple hundred of photos in a folder called “Around Our House” isn’t yielding much so you’ll have to image the golden autumn light and clear pavement in your head. 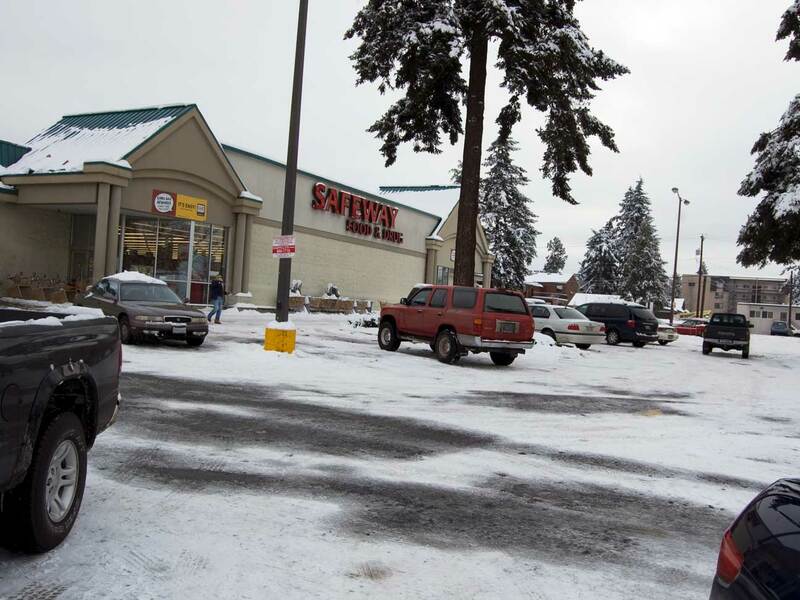 Here’s the Safeway parking lot. Doesn’t look too bad. The parking lot across the street was PERFECTLY clean. There’s a library annex there and we guessed they must have a private contract with some sort of do or die clause in it. That was yesterday. Now on to today. 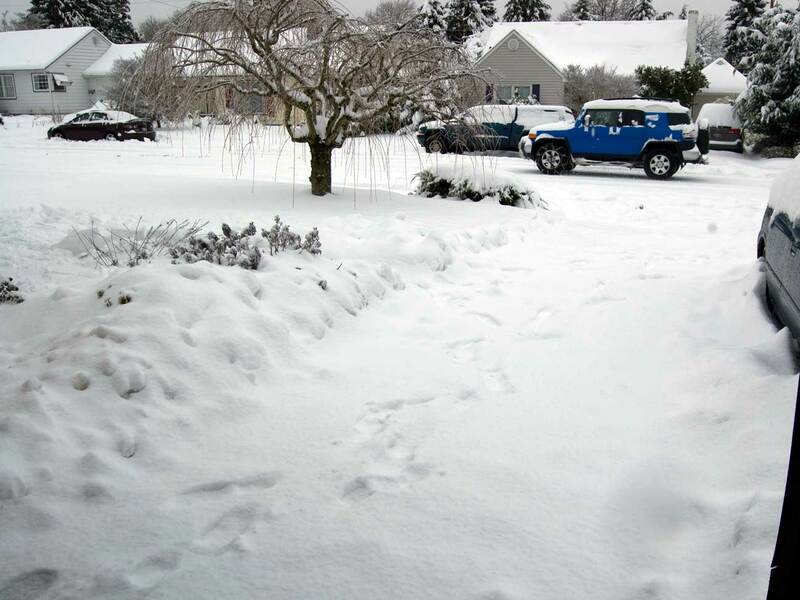 This is our driveway this morning after the latest round of snow. I was sitting here at my desk, all buckled down to get some work done before I power down for 36 hours to do holiday cooking, cleaning, decorating and celebrating. We never got a tree so I’m going to hang a string of lights and a few ornaments on the Ficus. I’m not much of a decorator to begin with but this is awfully pathetic. But back to my writing. I heard a huge clattering sound on the roof and since it’s way too early for Santa I figured the snow must be sliding off and I jumped up and ran to the window. I was right. It was scary loud. I sort bent down and covered my head which I’m sure would have been very effective if the world was crashing through the roof of the house. The snow completely filled in our nice shoveled walkway. Piled on our front porch. 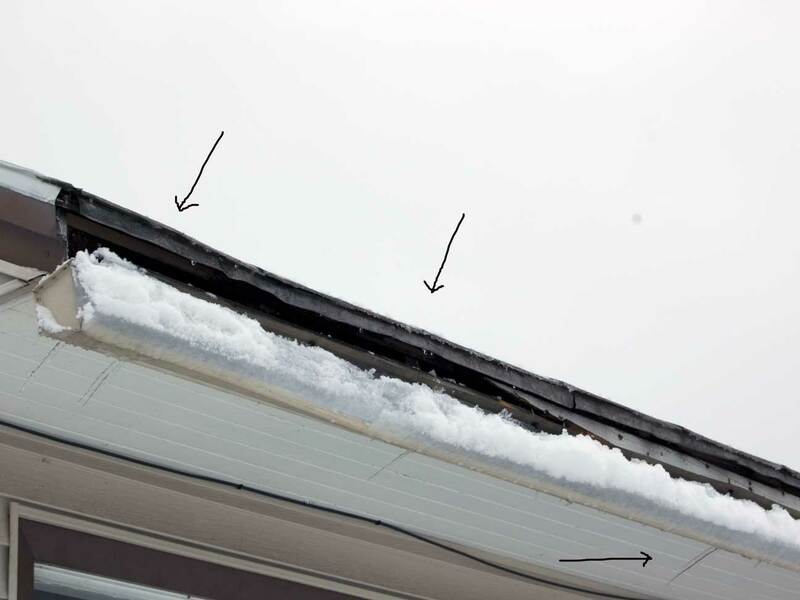 And almost completely destroyed our rain gutter. Look at the way the icicles are pointed in. And the way the wood is all chunked off. We’re not too upset. We stood around on the lawn gaping and laughing. One more thing to go on the list of things to fix. I broke the control string on the window shade in my room, too. And then there’s that car thing. 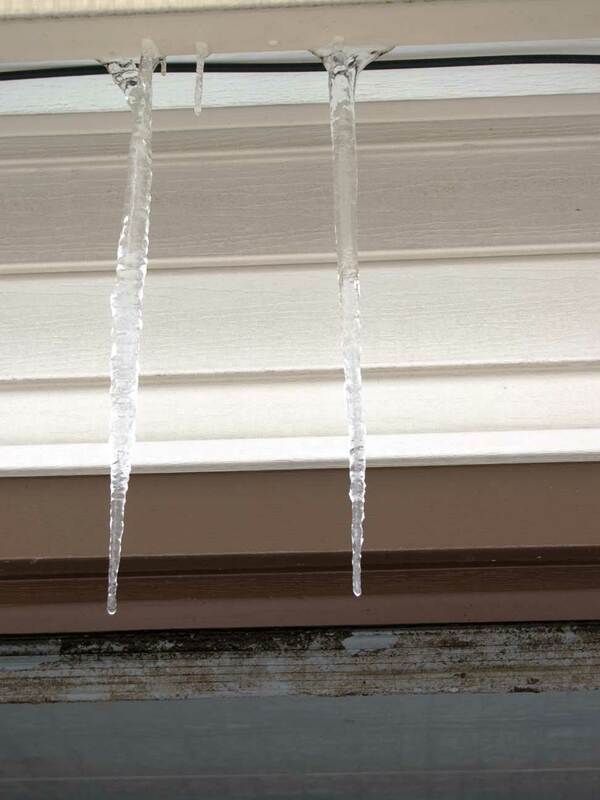 Here are some killer icicles in case we get the urge to stab each other. I told myself I wasn’t going to sit at the computer beyond 1pm but the snow thing got me all distracted. Just two more things to finish before I log off. I am planning on doing a holiday newsletter but probably after Jan 1st. 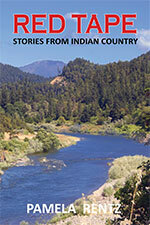 And it’s probably going to be shorter but I’ll offer a story for people who like stories. And it was going to be a Christmas story but since I’m running behind, maybe I’ll make it a winter story. I guess I shouldn’t worry about it. Not like there are Christmas story police.